Rachael Lyn's The Webs That Collect Inside Me MESA, Arizona – March 18, 2019 – The artwork of Mesa Community College art students Cheryl Berech (Tempe), and Rachael Lyn (Mesa), is featured in Shemer Art Center’s Mini Masterpieces exhibition, which runs through March 21 at 5005 E. Camelback Rd., Phoenix. Described as “A juried exhibition of works by Arizona artists that are small in size, yet large in terms of skill, concept and ingenuity,” the art pieces are no bigger than 12” x 12”. Lyn said she heard about the call for submissions on Instagram and created three pieces. Shemer Center accepted all three of her art pieces for the exhibition. 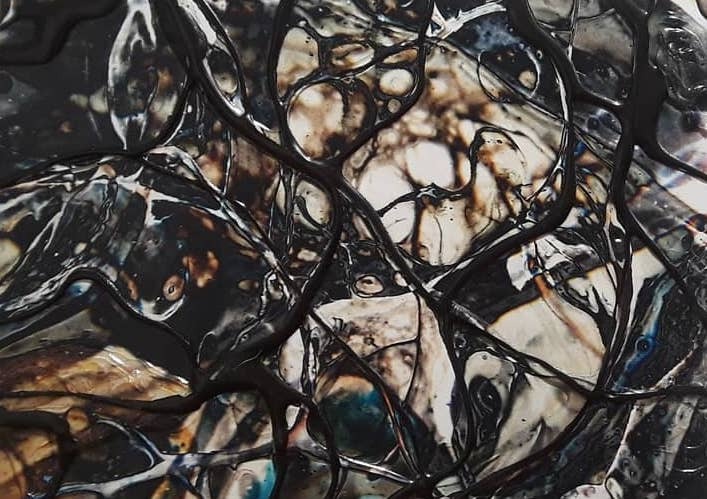 She used a technique called Acrylic Pouring to create the artwork she submitted. Lyn, who is working on an associate’s degree at MCC, would like to be a full-time artist, earn a bachelor’s degree at Arizona State University and continue to grow her craft. Cheryl Berech's Keisha She described her experience at the opening reception for the exhibition as "delightful." 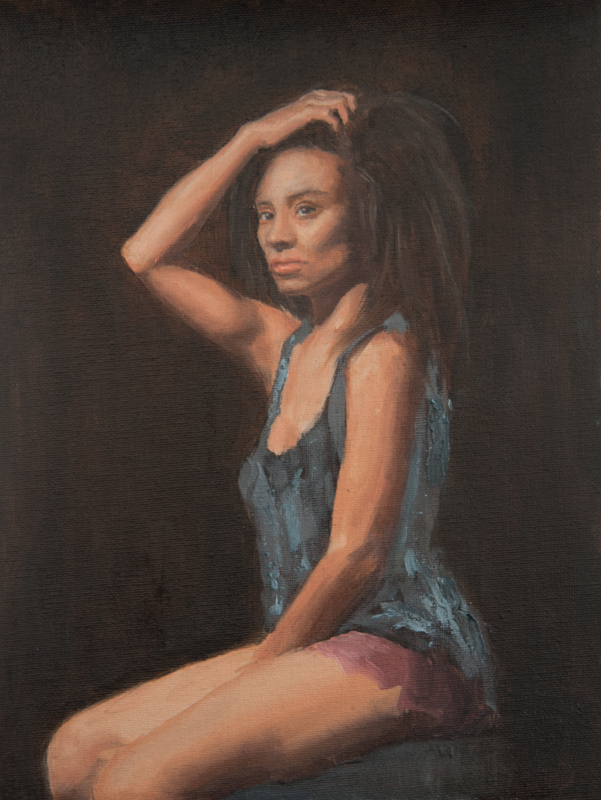 Another MCC student, Cheryl Berech, submitted a realistic figure painting of a women seated on a stool for the exhibition. Berech, an artist who is working toward a certificate in graphic design and web design at MCC, said she was going for feeling of a baroque style, but contemporary at the same time. She found out about the exhibit by talking to several different artists who had taken classes or exhibited at Shemer Center. She said MCC has helped her artistic growth at different levels and fosters a collaborative environment. Her goal is to teach and work as a visual artist—doing commissioned work and participating in projects for social causes. She is currently working on a nonprofit assignment painting critically ill children and is also involved in art therapy for dementia patients with the Tempe Artist Guild. The exhibit runs through March 21 and is open Tuesday – Saturday from 10 a.m. to 3 p.m. and closed Sunday and Monday. Shemer Art Center, located in the very first home built in Arcadia, showcases Arizona artists and offers visual art classes, workshops, exhibits and events. The Shemer Art Center is also one of the Points of Pride for the City of Phoenix. In 1992, the Phoenix Pride Commission asked Phoenix residents to name places that make Phoenix unique. Over 10,000 postcards, listing approximately 150 locations, were received during the initial campaign. From the 40 sites receiving the most votes, the final 21 Points of Pride were selected by another public vote. Learn more at https://shemerartcenter.org/.